Make sure your picture is no more than 300 pixels (wide) X 300 pixels (high). Save the photo as a JPEG (JPG) or PNG file, not exceeding 100 K in size. 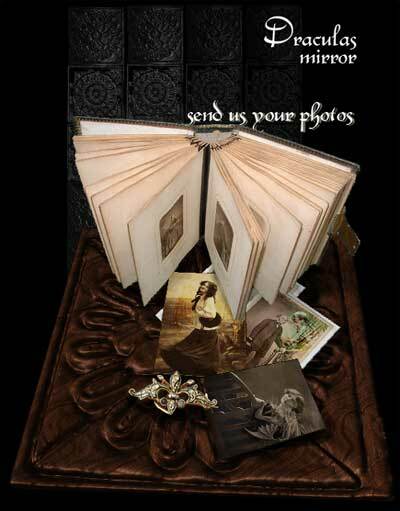 Then enter Dracula's Mirror and click on the 'Upload Pic' link. Fill in all the fields for your portrait (If you would like to include a few details about yourself, such as your location, interests, what you've been up to, and even your e-mail address for the like-minded to contact you - Old Curiosity Shop does not hold responsibility for any mis-use of your personal details) and then click the 'Browse' button to upload your picture from your computer. Your file browser will appear where you can navigate to the image on your computer and click 'Open'. When you've finished adding your details, submit your portrait by clicking the 'Upload your Dracula's Mirror Portrait'. If you trouble yourself to go to this small effort, Mr. Quilp will be incorrigibly happy to add your picture to his album, for the admiration of both yourself and your fellow brethren everywhere.